A thread for stamps with designs related to ancient Greece. This 1995 Greek stamp shows Melina Mercouri against the background of the Parthenon in Athens. She lived from 1920 to 1994 and was an actress, singer and politician. As an actress she came to international fame in 1960 when she starred in the film Never on Sunday. She campaigned against the Junta which seized power in 1967. She was the Greek Minister for Culture from 1981 to 1989 and 1993 to 1994. From a set issued by Greece for the 1972 Olympics, showing part of an ancient frieze. From an ancient Greek vase - one of a set issued by Greece for the 1984 Olympics. A 1970 Greek stamp showing Heracles (latinised as Hercules) about to kill the centaur Nessus, who had made off with his wife. A 1983 Greek stamp showing a famous episode from Homer's Odyssey. On his way back from the Trojan War, Odysseus lands on the island of the Cyclops, who include the man-eating Polyphemus who shuts Odysseus and his men in his cave. After Odysseus blinds Polyphemus by driving a stake into his single eye, he and the survivors escape by tying themselves to the bellies of Polyphemus's sheep before Polyphemus lets them out to graze. The stamp shows Odysseus strapped to the underside of a sheep. 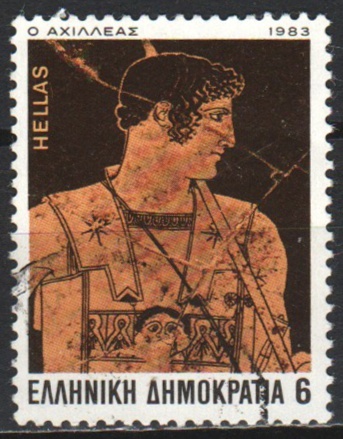 A 1984 Greek stamp showing a statue from the Parthenon. The statue is part of the British Museum collection, and is one of a group of marble statues over which there is dispute between Greece and the UK, with Greece demanding their return: they were removed and brought to Britain by Lord Elgin in the early years of the 19th century. A 1983 Greek stamp from a set showing scenes from the poems of Homer. This one depicts Odysseus and the sirens. The sirens were mythological creatures whose singing lured sailors to their deaths. Odysseus had the ears of all his crew plugged with wax so they would not hear the singing, but he wanted to hear it himself, so he had himself strapped tightly to a mast to stop him jumping overboard. According to some later versions of the myth, the sirens were fated to die if a sailor passed them by and survived - and drowned themselves after Odysseus escaped alive. From a 1970 Greek set showing the Labours of Heracles (Hercules in Latin): Heracles battling with the giant Geryon, whose cattle he had to steal as one of his labours. Geryon is variously described as having three bodies or three heads. Another 1970 stamp from the same Greek set showing Heracles killing a water monster, the Lernaean hydra, with the help of Iolaus, nephew of King Erechtheus who set the labours. Because Heracles had assistance, Erechtheus decided Heracles had cheated, and therefore this labour did not count. 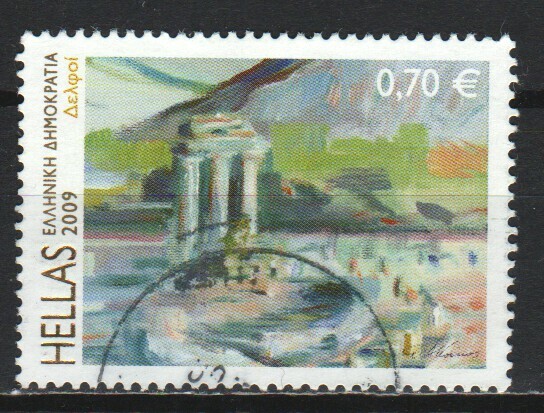 A painting of the Tholos of Delphi on a 2009 Greek stamp. Delphi had what was probably the most famous oracle of the ancient Greek world and hosted the Pythian Games, one of the most important Greek athletic competitions. The Tholos was a sanctuary dedicated to Athena. Columns of ancient temples on a Greek stamp of 1987. These columns are of the Ionic order - one of the three main types of ancient Greek architecture (the others are Doric and Corinthian). Ionic columns are the thinnest of the three, and have spiral scrolls, technically called volutes, at the top. The one-eyed cyclops Polyphemus being blinded, on a 1983 Greek stamp. In Homer's Odyssey, Polyphemus was a son of the sea-god Poseidon, and when Odysseus and some of his crew visited the island where he lived, he shut them in a cave and started eating them for dinner. In the end Odysseus blinded him with a stake and he and the the remaining crew members escaped. Polyphemus hurled rocks at their ship, but they missed, and, when taunted by Odysseus, prayed to his father Poseidon for revenge - which led to subsequent disasters for Odysseus, substantially delaying his return to his home island of Ithaca. The Greek goddess Iris on a stamp from a 1935-1937 Greek set. She was the goddess of the rainbow, and served as messenger of other gods and goddesses. She put in guest appearances in Shakespeare's play The Tempest and the Disney film Fantasia. Greece 1937: a famous fresco from the palace of Knossos of ritual bull-leaping in Minoan Crete. In the ritual, the leaper grasps the horns of the bull which then tosses its head, giving the leaper the momentum to perform acrobatics such as somersaults on the bull's back. An ancient Greek vase on a stamp from a Greek set of 1950-1. In 1959 Greece issued a set of stamps showing old coins. Here is one.